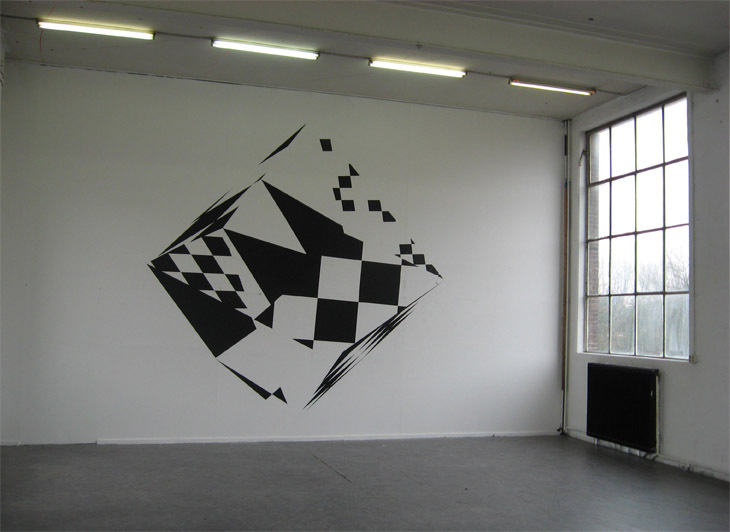 2010: While undertaking a residency at Duende Foundation, Rotterdam, NL, I came across a wall work by the American conceptual artist Sol LeWitt (1928-2007). LeWitt's work Isometric Form (2002) demonstrates a conception of space as isotropic - space which is homogenous, extending consistently in all directions and is an instance of Euclidian space. In response I proposed Non isometric form (2010) for the show held at the conculsion of the residency - an instance of anisotropy - non-isometic, non-homogenous space and includes the principle of reverse, or inverse perspective.